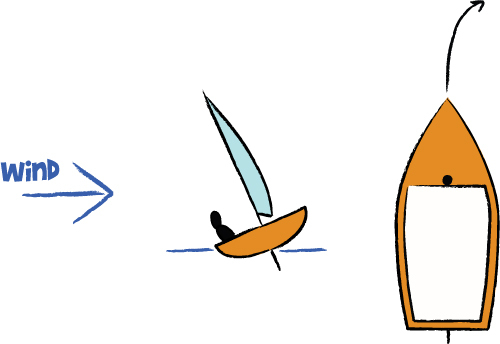 There is a set of five "elements" or essentials for sailing, which when carried out properly, will cover the basics of sailing and using a sail boat. Different sail settings are required depending upon the point of sail you are on, but generally, to find out how your sail should be set, ease the main sail out until it starts to shake along the luff (the part closest to the mast), then pull it back in until the shaking stops. Another technique is to use the telltales. Boat trim is the balance of the boat, fore and aft (ie running along the length of the boat). 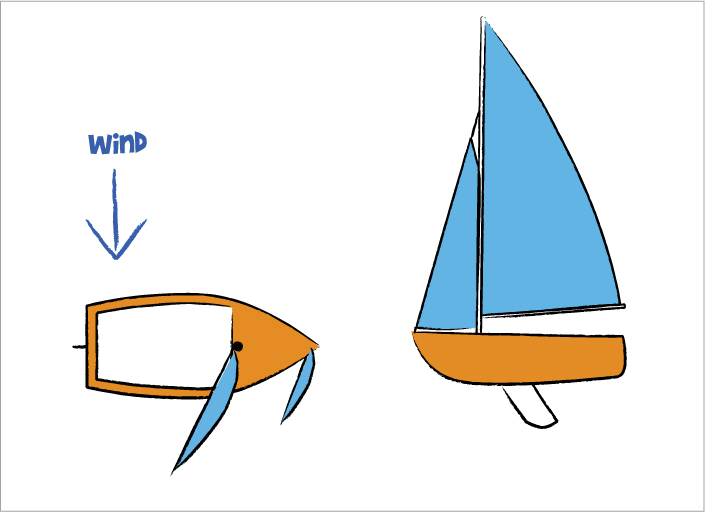 In light winds, boats should usually be balanced with more weight slightly towards the front of the boat, dropping the nose; the bow of the boat is usually more pointed than the back, and cuts through the water easier, whilst raising the big flat surface area of the back of the boat out of the water, reducing drag. 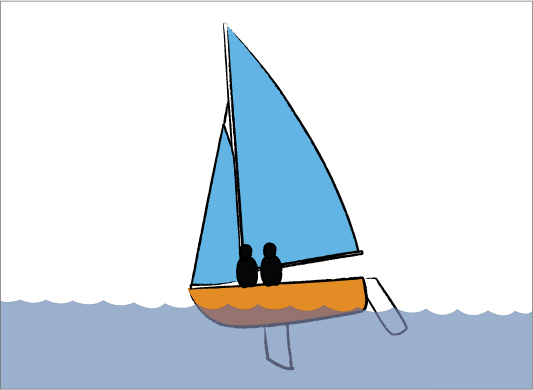 In stronger winds, the crew weight needs to be moved slightly towards the back of the boat, between the middle and back of the boat. If the wake of the boat is too rough, you are sitting too far back. When the weight balance is correct, the nose of the boat is raised slightly out of the water, and the stern drops into the water more; the large flat area of the stern makes it easier for the boat to plane, or skip over the top of the waves, if there is sufficient wind. For more diagrams, see our For more detail on how to control sail settings, see our Article on Boat Trim. Boat balance is the sideways balance of the boat. A boat will sail faster and a truer course when kept flat; if it is allowed to heel to either windward or leeward, it will not steer a true course, and the helm and crew need to compensate to counterbalance the power in the sails by either hiking, trapezing, or trimming the sail, to make the boat flat again, so it is more aerodynamic in the water. For more detail and diagrams, see our Article on Boat Balance and Heeling Effect. Centreboard setting is all according to which point of sail you are on; if the centerboard is not set correctly, this could result in sailing more slowly (because of increased drag), capsizing (because of insufficient resistance), or drifting off course (leeway), since the centerboard counteracts the turning forces of the power in the sail. 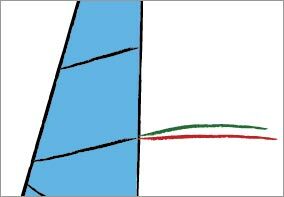 For more detail and diagrams, see our Article on Centreboard and Daggerboard Settings. This is basically getting from point A to point B in the quickest, most efficient way possible. It is not always the straightest course; if you can sail a quicker course via several tacks, then this is the course made good rather than a slow straight route. When carried out properly, these five essentials will cover the basics of sailing and using a sail boat. Each time a course alteration is made, these five should be checked off, and adjusted as necessary.